Get and give the best of Western Scientific, Eastern Energetic (Oriental medicine), Ancient, and Traditional Perspectives. Each Fact Sheet also includes Botany, Folklore, Fun Facts and more! Enjoy Healing Herb Fact Sheets from White Rabbit Institute of Healing™! 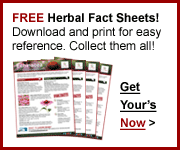 Download, print and share our medicinal and culinary Herb Fact Sheets for easy reference. There’s room on the back for you to add your logo, contact information, notes, and more! These colorful, easy-to-read sheets are designed to help you learn, explore and retain key information about each herb. Each sheet includes the best of Western Science, Eastern Energetic (Oriental medicine), Ancient, and Traditional Perspectives as well as some Botany, Folklore, Fun Facts and more! Share these Healing Herb Fact Sheets with clients, friends, and family. Add your logo and contact information on the back of each Healing Herb Fact Sheet to give to clients and prospects. Use the back of each Healing Herb Fact Sheet to add notes about each herb as you learn and discover more. Downloading each and every Healing Herb Fact Sheet takes time and energy. Many of you have been requesting an easier way to download these Sheets. You’re busy, and a fast easy-to-use and print approach would work best for you. We offer 3 different options: Free, Fast & Easy and Forever Plus! 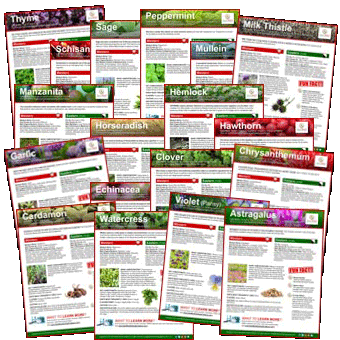 As a Member, you will always be able to download individual Healing Herb Fact Sheets, one-at-a-time. It takes time, but it’s free! For only $7, you can download 50 Fact Sheets at once in our NEW easy-to-download and print eBook Volumes. (Each volume contains 50 different Healing Herb Fact Sheets!) It’s fast and simple. Want ALL eBook Volumes? For the one-time fee of ONLY $19, you get EVERY current eBook Volume of 50 Healing Herb Fact Sheets PLUS all new volumes we create! FOREVER! (Next volume coming soon!) Fast, simple and ready-to-print. Saves you valuable time and energy. Sometimes easy and convenient is better than free! Angelica (Dang Gui), Astragalus (Huang Qi), Basil (Lou Li), Birch (Hua Mu Pi, Hong Hua Pi), Cannabis (Hou Ma Ren), Cardamon (Bai Dou Kou), Catnip (Mao Bo He), Cayenne (La Jiao), Chrysanthemum (Ju Hua), Clover (Mu), Daisy/Oxeye (Chu Ju), Dandelion (Pu Gong Ying), Deer Horn Velvet (Lu Rong), Echinacea (Zi Zhu Hua), Elderberry (Jie Gu Mu), Fennel (Xiao Hui Xiang), Garlic (Da Suan), Geranium (Tian Shu Kui), Ginger (Sheng Jiang), Ginseng (Ginseng), Hawthorn (Shan Zha), Hemlock (Tieshan), Horseradish (La Gen), Kelp (Kun Bu), Lavender (Xun Yi Cao), Lemon (Ning Meng), Licorice (Gan Cao), Lily of the Valley (Ling Lan), Magnolia Flower (Po Hua/Xin Yi), Magnolia Tree (Huo Po), Manzanita (Manzanita), Milk Thistle (Da Ji), Mint (Bo He), Motherwort (Yi Mu Cao), Mugwort (Ai Ye, Liu Ji Nu, Qing Hao), Mullein (Jia Yan Ye), Oak (Mo Shi Zi, Wu Bei Zi, Xiang Shi), Oats (Yan Mai), Peony (Bai Shao), Peppermint (See Bo He), Red Jujubes (Da Zao), Redwood (Shui Shan), Rose (Mei Gui Hua), Sage (Dan Shen Shenreg), Schisandra (Wu Wei Zi), Silver/Colloidal (Yin), Thyme (Bai Li Xiang), Violet/Pansy (Zi Hua di Ding), Walnut (Hu Tao Ren), and Watercress (Dou Ban). Atractylodis (Bai Zhu, Cang Zhu), Barley (Da Mai), Bay Leaf (Yue Gui Shu Ye), Burdock (Niu Bang Zi), Cacao (Qiaokeli), Cattail (Pu Huang), Cedar (Xue Song), Chamomile (Huang Chu Ju), Champagne (Xiang Bin Jiu), Chinese Yam (Shan Yao), Cinnamon (Rou Gui), Codonopsis (Dang Shen), Corn Silk (Yu Mi Xu), Dendrobium/Orchids (Shi Hu), Earthworm (Di Long), Frankincense (Ru Xiang), Goldenseal (Goldenseal), Green Onion (Cong Bai), Holly (Mao Dong Qing), Honey/Royal Jelly (Feng Wang), Honeysuckle (Jin Yin Hua), Hops (Pi Jiu Hua), Jasmine (Luo Shi Teng), Juniper (Du Song Zi), Ligusticum (Chuan Xiong), Lilac (Yuan Hua), Linden (Duan Hua), Lobelia (Ban Bian Lian), Lycium /Goji (Gou Qi Zi), Marshmallow (Yao Shu Kui), Mistletoe (Hu Ji Sheng), Mulberry (Sang Shen, Sang Ye, Sang Bai Pi), Myrrh (Mo Yao), Nettle (Xun Mai), Orange Peel (Chen Pi), Pine (Song), Poke (Shang Lu), Poria (Fu Ling), Pot Marigold/Calendula (Jin Zhan Ju), Pumpkin (Nan Gua, Nan Gua Pi), Red Cedar (Hong Shan Shu), Reishi (Ling Zhi), Saffron Fan Hong Hua), Skullcap/Scutellaria (Huang Qin, Ban Zhi Lian) St. John’s Wort (Guan Ye Lian Qiao), Sunflower (Xiang Ri Kui), Tree Peony (Mu Dan Pi), Turkey (Huo Ji), and Yarrow (Ya Luo). Alisma (Ze Xie), Aloe Vera, Amaranth (Xian Shi), Apple (Ping Guo), Bayberry (Yang Mei), Bearberry/Uva Ursi (Xiong Guo), Blackberry (Hei Mei), Blue-Green Algae / Spirulina (Lan Zao), Carnation (Qu Mai), Celery (Qin Cai), Clove (Ding Xiang), Comfrey (Comfry), Cranberry (Man Yue Mei), Eucommia (Du Zhong), Eyebright (Xiao Mi Cao), Fern (Jue Lei), Garden Sorrel (Cu Jiang Cao), Ginkgo (Bai Gou, Bai Gou Ye), Goldenrod (Huang Hua), Iris (Hu Die Hua), Java Tea (Mao Xu Cao), Marjoram (Mo Jiao Lan), Moss (Tai), Nutmeg (Rou Dou Kou), Phellodendron (Huang Bai), Pinellia (Ban Xia), Poinsettia (Da Ji), Praying Mantis (Sang Piao Xiao), Raspberry (Fu Pen Zi), Rehmannia (Di Huang), Rhubarb (Da Huang), Rue (Hou Hui), Sandalwood (Tan Xiang), Scorpion (Quan Xie), Shepherd’s Purse (Shepherd’s Purse), Slippery Elm (Chi Yu), Snakeskin (She Tui), Strawberry (Cao Mei), Sugar (Tang), Talcum Powder (Hua Shi), Turmeric (Yu Jin, Jiang Huang, E Zhu), Valerian (Xie Cao), Wild Asparagus Root (Tian Men Dong), Willow Tree (Liu Shu Pi), Willowherb (Za Cao), Wood Sorrel (Cu Jiang Cao), and Yerba Mansa (Yerba Mansa). Abalone Shell (Shi Jue Ming), Allspice (Duo Xiang Guo), Aloe Vera (Lu Hui), Apricot/Apricot Kernel (Xing, Xing Ren), Artichoke (Yang Ji), Ash Tree (Qin Pi), Bergamot / Bee Balm (Mi Feng Chun Gao), Bergamot Orange (Fo Shou Gan), Biota Leaf (Ce Bai Ye), Biota Seed (Bai Zi Ren), Black Pepper (Hei Hu Jiao), Boneset (Guan Ye Zelan), Borage (Liu Li Ju), Centipede (Wu Gong), Chestnut (Li Zi), Chicory (Juju Gen), Chinese Water Lily (Lian Zi Xin, He Ye, Lian), Cicada (Chan Tui), Cilantro (Hu Sui Ye) / Coriander (Xiang Cai), Cleavers (Zhu Yang Yang), Coconut (Ye Zi), Corn (Yu Mi), Cucumber (Huang Gua), Fig (Wu Hua Guo), Figwort / Scrophula (Xuan Shen), Gardenia (Zhi Zi), Hydrangea (Xiu Qiu, Chang Shan), Lime (Qing Ning), Marjoram (Mo Jiao Lan), Meadowsweet (Xiu Xian Ju), Milk Thistle (Da Ji), Oregon Grape Root / Mountain Grape (Eleigang Putao), Peach (Tao Zi), Periwinkle (Zhang Chun Hua), Phellodendron (Huang Bai), Plantain (Che Qian Zi), Pomegranate (Shi Liu), Praying Mantis (Sang Piao Xiao), Pulsatilla (Bai Tou Weng), Quail Grass/Celosia (Qing Xiang Zi), Salt (Yan), Sassafras (Chu Mu, Chu Shu), Slippery Elm (Chi Yu), Strawberry (Cao Mei), Tomato (Xi Hong Shi), Wheat (Xiao Mai), White Poplar (Bai Yang Zhi), Witch Hazel (Chiu Lu Mei), Wormwood (Qing Hao), and Yew (Hong Dou Shan). Agrimony (Xian He Cao), Arnica (Shan Jin Che), Ashwagandha (Nan Fei Zui Jia), Bamboo (Zhu), Barberry (Fu Niu), Beet (Tian Cai), Benzoinum (An Xi Xiang), Broom (Jin Que Hua), Cat’s Claw (Gou Teng), Chinese Plum Tree / Loquat (Pi Pa / Pi Pa Ye), Club Moss (Shi Song), Coltsfoot (Kuan Dong Hua), Cowslip (Huang Hua Jiu Lun Cao), Damiana (Da Mi A), Dragon Bone (Long Gu), Elecampane (Tu Mu Xiang, Xuan Fu Hua, Jin Fei Cao), Eleuthero (Ci Wu Jia), English Ivy (Chang Chun Teng), Foxglove (Mao Di Huang), Green Tea (Lu Cha), Hepatica (Gan), Hornet’s Nest (Lu Feng Fang), Horsetail (Mu Zei), Indigo / Baptisia (Da Qing Ye), Lemon Balm (Xiang Feng Cao), Lemon Verbena (Ning Meng Ma Bian Cao), Lemongrass (Xiang Mao), Liverwort (Tai), Marjoram (Mo Jiao Lan), Millet (Su Mi), Olive (Qing Guo), Oregano (Niu Zhi), Osha (Tie Da Yin Chen), Oyster Shell (Mu Li), Pink & Blue Ginger (Fen Hong He Lan Jiang), Pinon (Song Zi Ren), Plantain (Che Qian Zi), Pleurisy Root (Xiong Moyan Gen), Puffball (Ma Bo), Purslane (Ma Chi Xian), Rosemary (Mi Die Xiang), Saw Palmetto (Ju Ye Zong), Seahorse (Hai Ma), Silkworm (Jiang Can), Tarragon (Long Hao), Temulawak/Java Ginger (Shu Gu Jiang Huang), Trichosanthes (Gua Lou), White Poppy (Ying Su Qiao), Wood Betony (Betony), and Ylang Ylang (Yi Lan Yi Lan). Download Healing Herb Fact Sheets, ONE-SHEET-AT-A-TIME! Immediate access to all Healing Herb Fact Sheets. Get notified each week when we release a new herb. Download Healing Herb Fact Sheets, ONE-VOLUME-AT-A-TIME! Each eBook Volume includes 50 Fact Sheets, turning 50 downloads into 1. Get notified when new eBook Volumes are released. Download ALL eBook VOLUMES of Healing Herb Fact Sheets, FOREVER! Get ALL current and future eBook Volumes. Each volume includes 50 Fact Sheets, turning 50 downloads into 1. Immediate access to all Healing Herb Fact Sheets..
Can I still get Healing Herb Fact Sheets for free? Yes! Our Healing Herb Fact Sheets are always available to ALL our members for free. They may be downloaded, one-at-a-time, by visiting our member’s website. How can I get easy access to future Healing Herb Fact Sheets? Sign up! Whether you sign up for our free option or purchase our herb volumes, we will always notify you when new Healing Herb Fact Sheets and eBook Volumes are released. When we do, simply login to our member’s website to download or purchase new releases. Can I add my logo or contact information to Healing Herb Fact Sheets? Yes! We’ve purposefully left the back of each Healing Herb Fact Sheet blank so you can add your logo, contact information and other notes if you want. We want you to be able to share these with clients, friends and/or family. Is there more information available about each herb? Yes! Visit our Healing Herb Directory for LOTS more information about each and every herb we review. We’ve left the back of each Healing Herb Fact Sheet blank so you can add more information, notes and even your logo and/or contact information, making it easier to share these with clients, friends and family. Be Healthy! How do I get listed in your Worldwide Directory of Healers? Simply email us your contact and professional information and we are happy to review your submission for possible inclusion in our Worldwide Directory of Healers. It’s FREE! Do you have other resources or information I can take advantage of? Yes! Please visit www.WhiteRabbitInstituteOfHealing.com/References-Resources to explore our list of books, websites, blogs, schools, businesses and other resources we think are awesome.